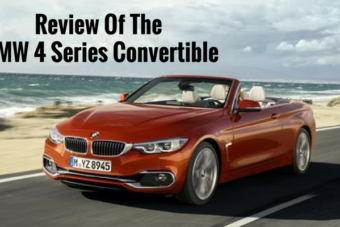 Looking for an objective review of the BMW 4 Series Convertible? OSV have got you covered, from engines to cool lease deals. 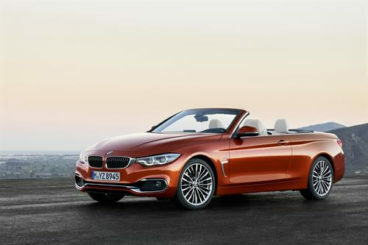 The brand new BMW 4 Series Convertible looks a lot like the Coupe variant. The only major difference is that it lets more sunshine into your cabin. Perfect for when you’re freewheeling down a country lane on a boiling hot summers day with the roof down. The coupe handles bends slightly better. After all, it weighs less. But will you really care about that when a gentle breeze is caressing your pink cheeks? Join OSV as we take a closer look at what this car is all about with our 2017 BMW 4 Series Convertible review. We’ll start with the car’s weight. Thanks to the addition of a folding metal roof, this 4 Series cabriolet tips the scales at around 1800kg. As such, it gets a bit grumpy whenever you change direction sharply and suddenly. However, that’s really the only downside of the driving experience. The steering is well-weighted, precise and meaty. Ride quality is good, thanks to a suspension system that’s been setup to cushion the blow from lumps and bumps. And the car doesn’t shudder and shimmy too much over worst surfaces, thanks to its stiff structure. There are plenty of engines to choose from, and something to suit everyone – a trio of petrols and a trio of disses. Two diesel models – the 430d and the 435d – are the only ones that offer four-wheel-drive instead of rear-wheel-drive. This means more strength and grip. However, we think the four-cylinder 420d will suit most people just fine. It pulls a lot of its power from low down, and is at home on both the motorway and the town. The petrols are smooth. Both of the two six-cylinder models – the 430i and 440i – are a whole lot quieter than the diesels, with even the four-pot 420d diesel engine making a fair amount of noise. We think the smooth petrol engines are a better match for an open-top; they’re quiet, fairly quick, and offer a genuinely good driving experience. 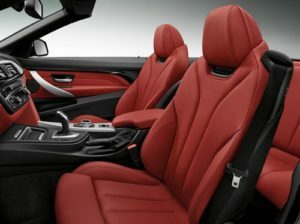 The 4 Series Convertible is a lot like the coupe, both inside and out. We’re certainly complaining, and we doubt many buyers will either, as this means a smart dashboard that’s well-appointed and logically laid-out. The car gets the brand’s much-praise iDrive infotainment system that’s intuitive and super easy to get the hang of. One complaint we have, however, is that the dashboard is beginning to look dated. It’s smart, well-appointed, and fit and finish is impossible to argue with. But there are more modern designs on the market. It’s easy to get comfortable once you’re inside, thanks to an adjustable steering wheel and driver’s seat. Passenger seat adjustment is also available. Interior space is good upfront, but while it’s easy enough to get into the rear seats, passengers won’t be greeted by a whole lot of room once they’re there. Both head and legroom is restricted, and we’ll wager that your taller passenger will be doing a fair amount of complaining if you leave them in there for too long! The boot measures 370-litres, which seems reasonable for a premium convertible. However, the folding metal roof is a blessing on this blissful summer days when you’re just – but a curse when you need to do the shopping, as it eats into boot space. You’d either have to leave the roof up or not go shopping – the choice is yours! Still, the folding metal has other uses – it proves pretty protective in the event of thieves trying to break into your beloved BMW. Standard equipment is good and includes heated seats, parking sensors, a 6.5” colour display screen, climate control, cruise control, and sat nav. Opt for the Sport model and you get larger alloys and sports seats, but the more expensive Modern and Luxury models seem superfluous. If there is one optional extra we recommend you get, it’s the Air Collar feature. This neat addition comes in handy whenever you have the roof down and your passenger is complaining that they’re cold (rolls eyes). You know what we mean – annoying! Add this feature, and hot air will be blown on the back of their neck to ensure they stay warm. In terms of safety, the new 4 Series Cabriolet hasn’t been put through its paces yet by EuroNCAP, but we expect it to be safe as houses. Moreover, the 3 Series bagged 5/5, and we would expect this to follow suit. Your standard safety kit includes brake assist, lots of air bags, stability control, and ABS. Prices for the new car start out from £35,000 and rise to £49,600. For more information on our leasing deals, you can check out our page here. In terms of its running costs, most of the models in the range are fairly economical, with the exception being the range-topping petrol. The 420d diesel is the cheapest to run, and can achieve fuel economy returns of 58.8mpg while emitting just 127g/km of CO2. If, however, you want a good blend of economy and performance, we recommend the 428i petrol. Powered by a 2.0-litre engine, it’s good for fuel economy return of 40mpg and emits 159g/km of CO2. It’s also considerably quicker than the diesel. The range-topping 3.0-litre petrol engine is in its own bracket, and returns 30mpg at best. Unfussy lines and an aggressive face are what helps this car to stand out. With more weight than the coupe, BMW needed to make sure the engines were powerful enough to make car interesting. They’ve succeeded. It’s heavier than the coupe, but it’s still a pleasure to drive. No one buys a car like this because of how practical it is. But you still need some boot space, and the fact that the roof eats into precious boot space on days when you really don’t want to do can get frustrating. The A5 offers more boot space in general. The adaptive suspension and auto gearbox enhance this car, but they’re both only available as expensive options. 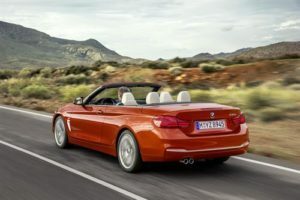 Let’s see how the car fares against the other contenders in the comparison section of our BMW 4 Series Convertible review. 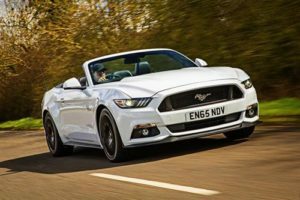 The new Ford Mustang Convertible is a beefy-looking drop-top that has for too long been an elusive car to us Brits. Now that it’s finally here, does it manage to live up to all its hype? Only two engines have accompanied the iconic car to our shores, but they’re both bursting with character. And while the EcoBoost engine has (unsurprisingly perhaps) failed to win over American buyers with its concerns for the environment, it’s expected that it will be the most popular with us Brits. It’s a 2.3-litre engine that develops 312bhp, and which can thrust you from a standstill to 62mph 6.0 seconds flat. Top speed is 145mph, and all the power is delivered strongly. The engine comes with a turbocharger that manages to keep running costs down, but which does cause the engine to lose some of its feral savagery. However, you still get enough of a fizz and cackle to keep you happy. Having said that, it can’t compete with the V8 when it’s in full flow and on song. This is a big, masculine engine emits that classic American sound we’ve all dreamed of. It suits the car to a tee and will be the engine the purists go for. What might also influence your final decision are running costs. The 2.3-litre EcoBoost engine is the cheapest to run of the pair, and comes with mpg figures on par wit the Ford Focus RS, which shares the engine. It can average fuel economy of 34.4mpg, and costs £225 a year to tax. Inside, you’ll be pleased to be greeted by the traditional, retro Mustang dash we’ve seen in the movies. It still manages to feel relevant in 2017, and doesn’t feel at all old-fashioned or – worse still – gimmicky. Part of the reason for this is that Ford have introduced lots of new stuff, including the brand’s SYNC 2 infotainment screen and metal toggle switches. Fit and finish isn’t on par with the BMW, and build quality isn’t one of this car’s strengths. And when you lower the roof, the car feels less rigid and softer. To that end, it’s to really a proper out-and-out performance car, but more of a relaxed cruiser. It’s a wide car, too, which reminds you that it was designed with American roads in mind. This can make it tricky to park, but practicality is reasonable on the whole. Four adults can sit in comfort, while there are plenty of interior storage spaces for your bits and bobs. The boot measures a respectable 320-litres, but that’s still significantly smaller than the BMW’s. The new Mercedes C-Class Cabriolet is a classy four-seater open-top that has effortless style, solid build quality and plenty of German refinement. Compared to the BMW, this Mercedes is not terrifically engaging to drive. It’s designed to be more of a luxurious cruiser than anything else, but that’s not necessarily a bad thing – it just depends what you’re looking for. Ride quality is good, despite the added weight of the roof. If you leave the car in its softest suspension setup, it will absorb our worst bumps and lumps without much hassle, but the steering is a bit too inconsistent for our liking. In terms of the engines, we like the 201bhp C250d diesel model. It’s powered by a 2.1-litre four-pot engine that can do 0-62 in 7.2 seconds, but which might be too noisy for some of you. Especially during the winter, it does tend to whine and groan. However, since the roof will be up, you won’t hear it too much. The C220d is your only other diesel option, but it has less power. 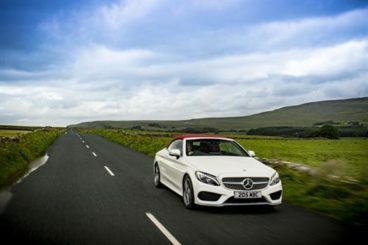 In terms of the petrol models, a 2.0-litre turbocharged engine comes in two versions, while a high-performance C43 AMG model is backed by a meaty 3.0-litre V6 engine that’s the quickest in the range. Running costs are surprisingly good, at least where the diesels are concerned. The C220d 168bhp is the most frugal, and can return fuel economy of 62.8mpg if you stick with the manual gearbox. Adding four-wheel-drive and the 9-speed auto ‘box is tempting, but it will bump up costs. The interior is the Mercedes C-Class Cabriolet’s calling card. It’s expensive, indulgent and brimming with high-quality materials. There are lashings of aluminium, leather and wood, and we especially like the addition of the circular air vents that you’ll also find in the S-Class Saloon. When it comes to practicality, the Mercedes doesn’t fare any worse than the BMW. It has four seats, a 355-litre boot that drops to 260 when you fold the roof, and some reasonably-sized door bins. Access is tricky, thanks to the long doors, but few people buy cars like this for their usefulness. This is an aggressively styled cabriolet that feels mighty powerful once you fire it up. It’s bulkier than the coupe for obvious reasons, but the engines on offer ensure there is plenty of power and a decent amount of agility. The choice of engines is good, while the practicality of the car wouldn’t be an issue were it not for the boot-eating roof. That aside, the new BMW 4 Series Convertible makes for a fine, upmarket cruiser that looks the part.